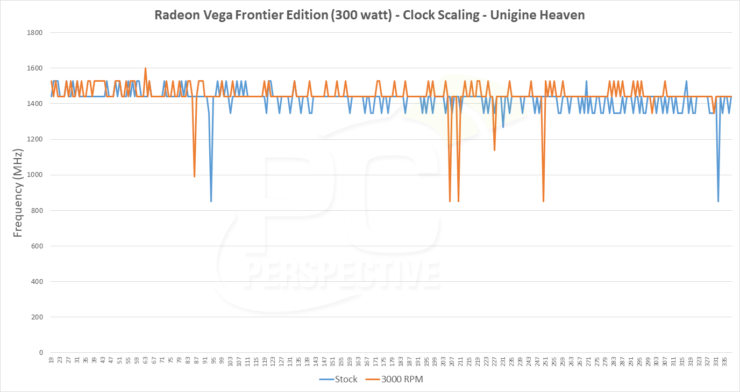 The first review of the AMD Radeon Vega Frontier Edition graphics card has just been posted by PC Perspective. The review covers a lot of interesting details such as power consumption, average clock speeds and performance of the card in gaming and professional workloads. 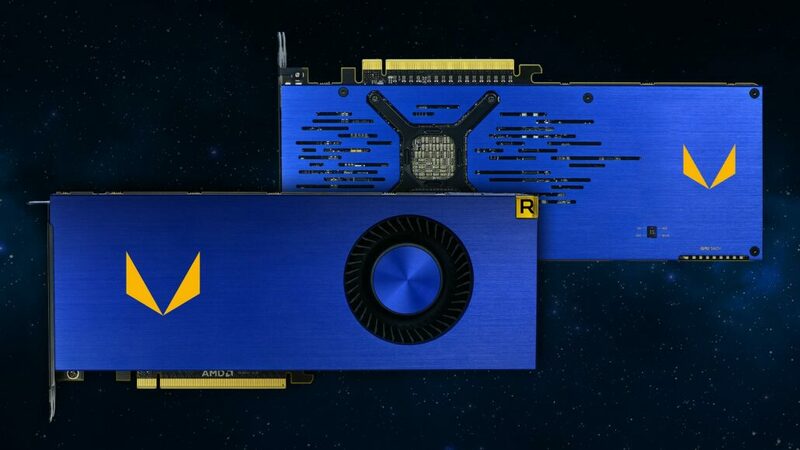 The AMD Radeon Vega Frontier Edition has been the most talked about GPU of this month and for good reason. It’s based on AMD’s Vega 10 GPU which is their latest high-end chip after a long wait of two years. 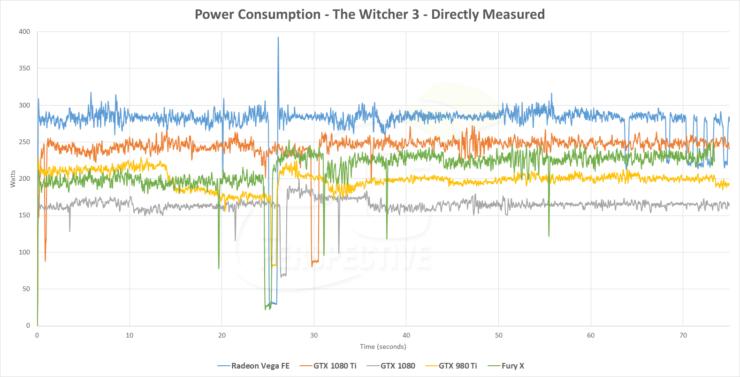 The Vega 10 GPU replaces the Fiji XT GPU and is targeted at enthusiast gamers and the high-performance professional, workstation and compute oriented markets. Vega is AMD’s entry back in the enthusiast game and the Frontier Edition is the first consumer card to feature the new core. The Vega 10 GPU is much bigger than the GP102 GPU from NVIDIA which has a die size of 471mm2. The difference between both is that the GP102 die not only performs better in terms of overall efficiency, but does so while consuming less power. Here’s the worlds first look at the Vega 10 GPU die shot exclusively from PCperspective. The AMD Radeon Vega Frontier Edition will feature two variants, an air cooled and a liquid cooled model. Currently, the card is available in only an air cooled model which comes in a nice blue industrial texture with a glowing yellow “R” emblem placed in the corner. The whole card is powered by a dual 8-pin connector configuration which confirms a TDP of around 300W. We have noticed in several tests that the air cooled model fails to sustain the maximum boost clock and has a average clock speed of 1440 MHz while consuming more power than the GeForce GTX 1080 Ti. Even with the fans set at 3000 RPM, the card was unable to hit 1600 MHz and only achieved 1528 MHz maximum clock speeds (note – not average). It is also stated in the review that what was supposed to be the boost clock is only achievable through overclocking and increasing the power limit to hit 1600 MHz. Users will still face clock throttling down to 1500 MHz ranges with such overclock. 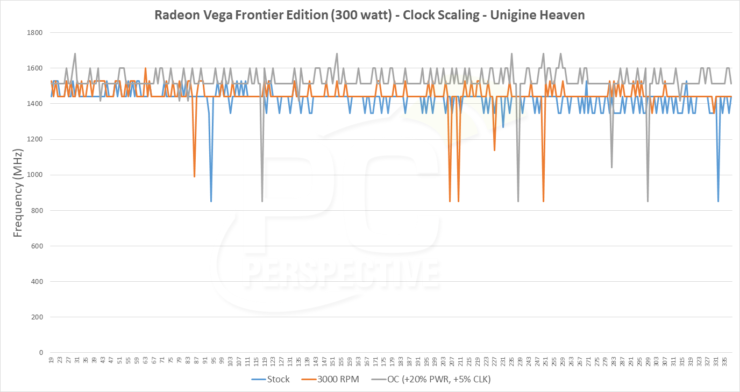 For more details on AMD Radeon Vega Frontier Edition clock speeds, performance numbers, head over to their full review over here! The fully exposed PCB shots by PC Perspective show that the card is fairly large and has the typical full length, full height form factor. The card, even while based on the HBM2 solution makes use of a long PCB which is indicative of the fact that the extra yet underutilized space is there for a more beefy heatsink solution to keep the card running at optimal thermals. 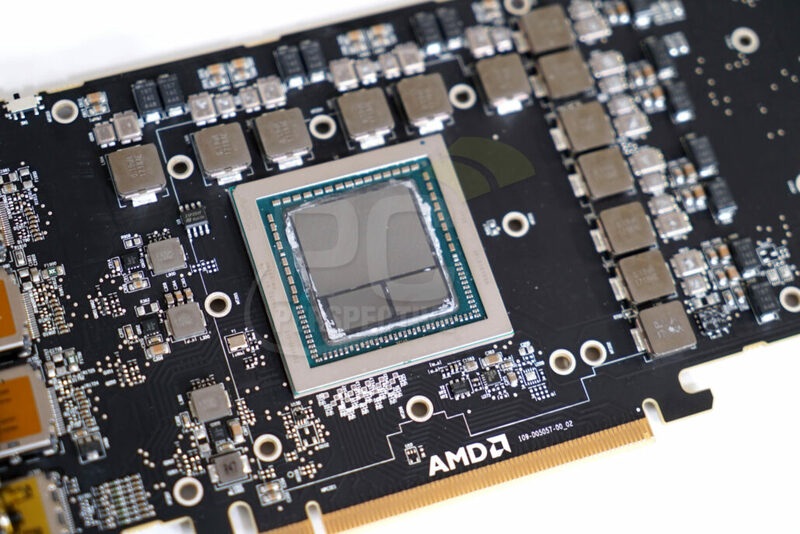 Even with such a large heatsink in place, the card throttles so most users can expect the Radeon RX Vega models to ship with liquid cooling solutions as reference. 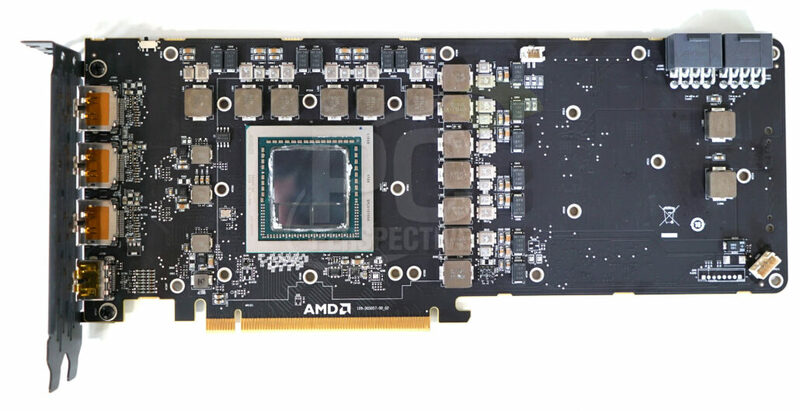 Note that the electrical components themselves take up much less space and we can see that if the extra cooling wasn’t required, the card would have measured the same length as a Radeon R9 Fury X. We can expect some changes in the coming gaming focused Radeon RX Vega cards, but for now, even the liquid cooled model of the Radeon Vega Frontier Edition has a really long PCB. The back of the PCB comes with a backplate but underneath it you can spot various components. 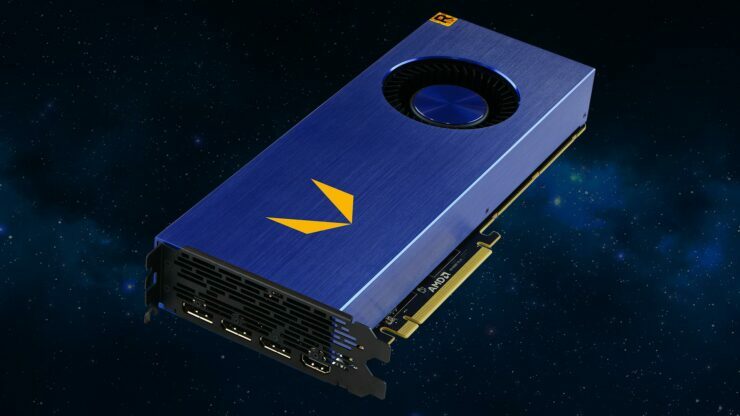 The AMD Radeon Vega Frontier Edition is shown to have gaming and synthetic performance much lower than that of a NVIDIA GeForce GTX 1080. In professional workloads, the card is somewhat comparable to the Quadro P5000 which uses the same GPU configuration as the GeForce GTX 1080 although optimized for professional workloads. 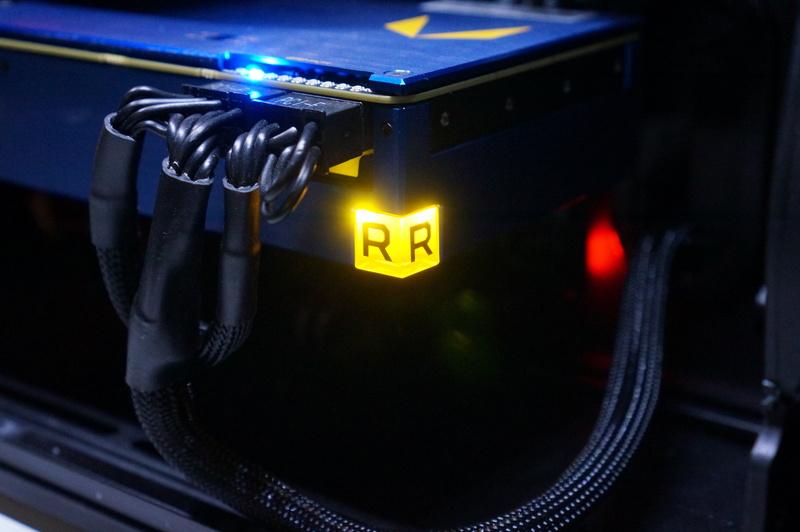 The Radeon Vega Frontier Edition is an impressive graphics card from a technical standpoint but it’s failing to showcase the actual potential of that extra tech, features and upgrades that it has received over the Radeon R9 Fury X in real-world benchmarks.